This summer I attended a Let's Get Twiggy workshop at Will Roger's Arboretum (read about it here SUMMER WREATH MAKING) where we made wreaths and other branch-y confections. A nice inventory of branches, twigs, and tree trimmings were available for our use. I went home with two LARGE dead branches harvested from a large crepe myrtle that had succumbed to our harsh winter. 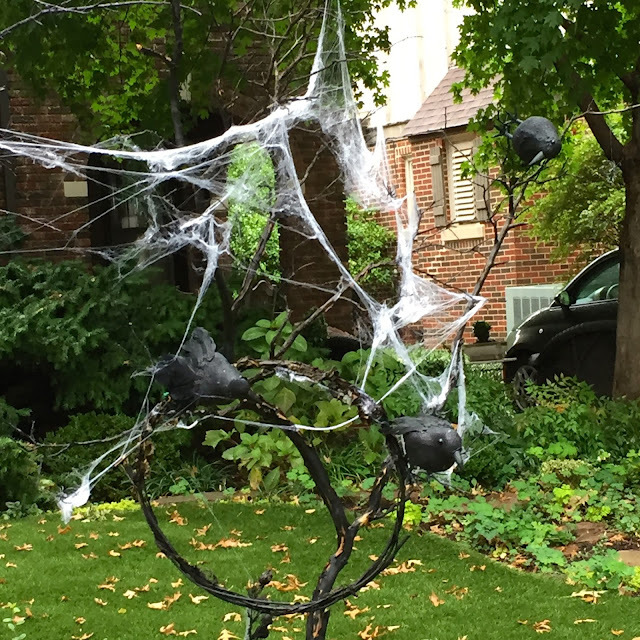 .... how wonderfully sinister they would look painted black and adorned with stuffed crows and spider webbing. As LC says in the above video, very Hitchcock-ish. Don't see the video on your device? Go here. 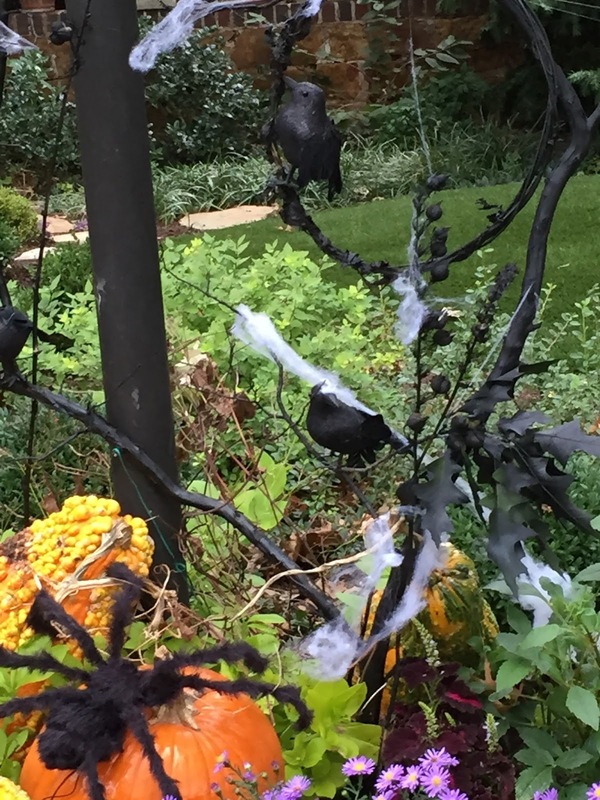 One must not forget a furry spider, or two....leaves blown and tangled along with some dripping Spanish moss adds to the eery effect, don't you think? 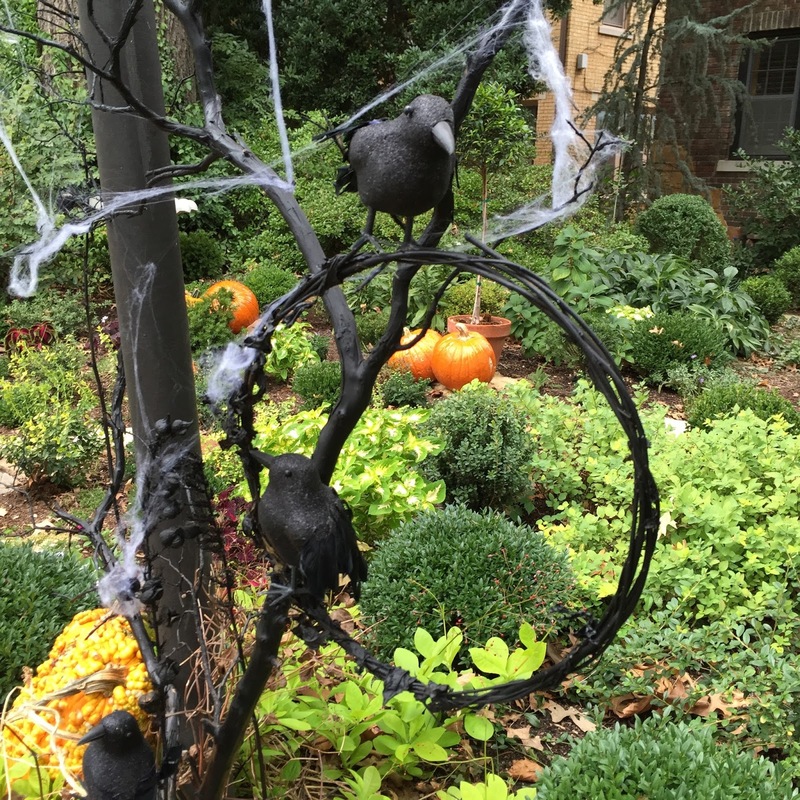 More frightful embellishments may, or may not be added as Halloween approaches. Who's to say? Blackened branches and leaves can also be brought in, of course, in a more diminutive manner. To make a centerpiece for Halloween, go to this p o t a g e r post (here), or for other ideas visit my Pinterest page here. when the goblins go home. No need to store or stash. Gotta love that. COMING UP THIS WEEK: One of the most dramatic changes I've made to my garden landscape since its inception 25 years ago. I will also be talking about it in an upcoming 4 YOUR GARDEN segment. Stay tuned.